Toddlers are amazing. A week or two ago, Genevieve started making clear associations, and it was like a little switch flipped on for her. 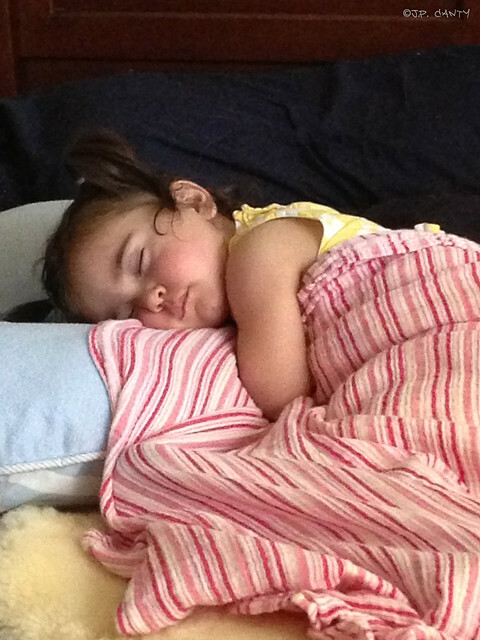 It all started around naptime, which if you've been reading for a while, you know has been fraught with challenges. She took me by the hand, and led me to the bedroom. "Up," she said, arms up. A few days ago, she dragged me to the bedroom (because she was tired), and I said something like, "Ok. We'll do naptime in just a minute," and then went to pick up one or two things. Clearly, I hadn't gotten the message. Genevieve dragged me to the living room, picked up her sheepskin, and had me put it on the big bed. Tired = nap = sheepskin = big bed. She knows what she needs, and when she needs it. I can't wait to see what the future hold for all of us. That is some wonderful and adorable communication.